We made the news!!! 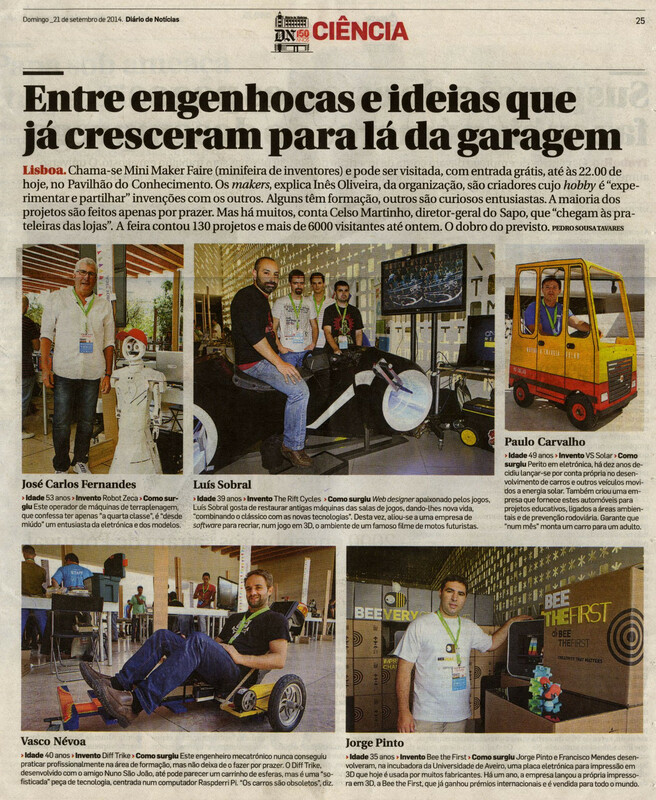 Here’s Portuguese television channel 3 (“SIC”)’s coverage of the event, with a 3 second apparition of the DiffTrike at timestamp 1:39. Plus, the national radio “Rádio Renascença” also promoted the event and interviewed me in studio about the project. My 20-second promotion spot can be heard on that page; an 8-minute interview (from 07:45 to 15:45) in between a few more Makers was aired just before the Faire. And this, my friends, is the end of this MakerFaire series. For over a month I’ve posted one article every day (most of them written about one or two months ago and published automatically) describing our odyssey to get the Trike running for the Faire. The deed is done, this iteration of the Trike is mostly finished, and we now have other things to do with our time unfortunately. ← Off to the Faire!